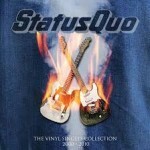 Share the post "Album review: STATUS QUO – The Vinyl Singles Collection – 2000-2010"
This box set is the last release in a series of 5 charting all the single releases from Quo throughout their long career. As with the previous box sets each single is lovingly recreated in its original sleeve on heavy weight vinyl for your listening pleasure. What we have here is the band’s output from 2000 – 2010 and contains ten singles in all. The noughties were like the previous decade for Quo, not one of their best or most creative. However this is Quo we are talking about here so the emphasis as always is on the fun factor and on that score the guys hit the mark. Unlike the 90’s collection there are far fewer cover versions here, the band’s cover of ‘Mony, Mony’ being the notable exception. There are however a number of live tracks which appeared as B sides which are top notch, the pick of these being an excellent version of ‘Forty Five Hundred Times’ and not one but two versions of the fan favourite ‘Gerdundula’. Of the tracks written during the era the best are ’Jam Side Down’ which is still a fixture in the band’s live shows and ‘All Stand Up (Never Say Never)’. Another track of note is Quo’s attempt at the lucrative Christmas single market with the tinseltastic ‘It’s Christmas Time’. Depending on your level of Christmas spirit this song is either a festive classic or a holly horror, I will leave that up to you to decide! This entry was posted in ALBUM REVIEWS, ALBUM REVIEWS (Mobile), All Posts and tagged 2000 - 2010, All Stand Up (Never Say Never), collection, Francis Rossi, Jam Side Down, live, Rick Parfitt, rock, singles, Status Quo, Vinyl. Bookmark the permalink.